This web page was inspired by a discussion on the Usenet group sci.physics.research entitled “The Black Fishing Hole”, in which Edward Green asked for an account of precisely what would happen if someone lowered an object through a black hole’s horizon on a fishing line. I gave a reply describing a slightly different, but related, scenario: that of a constantly accelerating observer in flat spacetime trailing an object behind them. Darryl McCullough made the connection explicit, pointing out that a first-order approximation of the Schwarzschild metric near a black hole’s horizon gives a coordinate system for flat spacetime describing just such a class of observers. The purpose of this web page, then, is to analyse in detail (using only special relativity) some interesting thought experiments that can be carried out by a constantly accelerating observer, who sees a “Rindler horizon” in spacetime that is very similar to the event horizon of a black hole. This is certainly not a perfect substitute for a full, general-relativistic analysis of the same experiments carried out near a black hole’s horizon. Rather, what it represents is an interesting limiting case: a black hole so massive that the spacetime curvature at its horizon is negligible. My thanks to Chris Hillman for many helpful comments and suggestions. Imagine that it’s possible to build a spaceship that constantly accelerates. We don’t really care how it does this; this is a thought experiment in physics, not an exercise in interstellar spacecraft engineering. Because we’re dealing with relativistic velocities, we need to be precise and say that the spaceship undergoes constant proper acceleration: passengers will measure a constant inertial force pushing them towards the back of the ship, whereas observers in motion relative to the ship will necessarily describe its acceleration differently. In other words, the event of the emission of the flash of light is always in the present, and always a distance of 1/a behind the ship. As far as the passengers on the ship are concerned, the flash of light isn’t getting any closer. Any signal sent from an event that lies to the left of the dashed line in the figure will be unable to reach the spaceship, because that would mean out-racing the pulse of light that itself fails to catch the spaceship. So, as far as the passengers on the ship are concerned, the dashed line constitutes a kind of event horizon, known as the Rindler horizon. Assuming that the spaceship continues to accelerate forever, anything that ends up behind the Rindler horizon will be lost to the passengers forever. Of course, this is not the same as a black hole’s event horizon in two very important respects. Firstly, it’s always possible to stop the spaceship accelerating, so this horizon’s persistence is a matter of choice, not physical law. Secondly, there is nothing corresponding to a black hole’s singularity to do any actual damage to anything passing through the horizon. However, the analogy extends this far: a constant force is required to keep the spacecraft a constant distance (by its own measurements) from the Rindler horizon, and, apart from the effects of spacetime curvature (which can be made as small as we like by imagining a black hole with a large enough mass), all the other phenomena (red shift, time dilation and so on) that occur in the vicinity of a black hole’s horizon can be found in the vicinity of a Rindler horizon. There is even an analogue of Hawking radiation, known as Unruh radiation. Along the x-axis, s agrees with x, and q=0. Although q can be used to parameterise each of the hyperbolas of constant s, it does not correspond to elapsed proper time along these curves; rather, that is given by τ=qs. Along lines of constant q, s measures proper distance. We can imagine a flotilla of spaceships, each remaining at a fixed value of s by accelerating at 1/s. In principle, these ships could be physically connected together by ladders, allowing passengers to move between them. Although each ship would have a different proper acceleration, the spacing between them would remain constant as far as each of them was concerned. The easiest way to see this is to note that increasing q is equivalent to performing a boost on everything, leaving intervals in spacetime invariant. Another way to describe this is to say that the vector field ∂q generates an isometry of spacetime. When an object is accelerated in such a way as to preserve the proper distances between its different parts, this is referred to as Born rigid motion (after the physicist Max Born). The easiest results to calculate involve imagining various observers and objects at fixed positions in terms of our s coordinate, so these are the first things we’ll consider; more interesting possibilities will follow. We will allow light signals to cross between different values of s, but nothing else will move. where E2 is the energy of the flash measured at s2. This will hold regardless of the particular value of q1. So as we’d expect, light that travels forward away from the Rindler horizon is red-shifted. Similarly, light that travels towards the horizon is blue-shifted. Because observers with fixed s coordinates are constantly accelerating, light from distant stars will suffer constantly increasing Doppler shifts, so (unlike the case with black holes) it’s meaningless to talk about a blue shift for light arriving from infinity. Again, let a flash of light (or a radar pulse) pass between two observers at s1 and s2, but this time suppose it is reflected back to the sender, who measures the total elapsed time between emitting the pulse and receiving its reflection. We can make this calculation simpler by assuming we emit the pulse at the event (–t1, x1) and receive it at (t1, x1); that is, the two events lies on the hyperbola x2 – t2 = s12 at the same x coordinate and opposite values for the t coordinate, and so by symmetry the event where the pulse is reflected by the ship at s2 will lie on the x-axis at (t, x) = (0, s2). 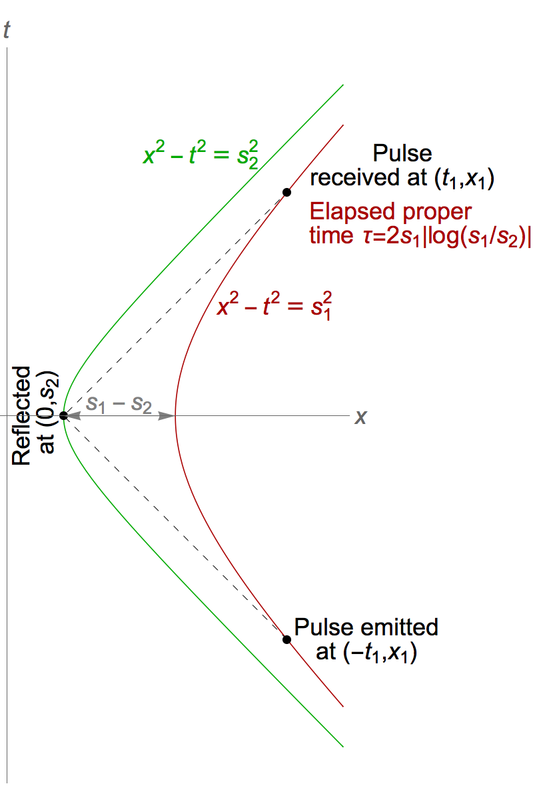 which state that the emission of the pulse (and the reception of its reflection) both occur at s=s1, and that the event of the reflection is connected by a light ray to the emission and reception, and hence has zero space-time separation from those events. For non-accelerating observers, we would expect half the elapsed time to measure the proper distance between the emitter and the reflector at the time of the reflection. But τ/2 will be greater than |s1–s2|, and as s2 approaches zero, it will tend to infinity. So, in the flotilla, even though the ships remain at a fixed proper distance from each other, as measured in instantaneously comoving frames, that distance can not be found with the kind of radar range-finding methods that are applicable in non-relativistic situations, or when the bodies in question are moving at constant velocities in flat space-time. Suppose we fix the s coordinate of one end of a string and let it dangle above the Rindler horizon. We’ll call the s coordinate of the fixed end s2, and that of the free end s1. Because the tension in the string becomes zero at the free end, it’s easier to deal with the boundary conditions if we describe everything in terms of s1. We will assume that the string obeys Hooke’s law exactly (that is, each part of it stretches in proportion to the force applied) even as the tension it experiences grows arbitrarily large; this is unrealistic, but it is the simplest assumption we can make that’s compatible with special relativity, which does not permit perfectly inelastic bodies. (There are some further restrictions needed, which we’ll describe shortly.) We’ll call the constant of proportionality k, and we will assume that the string has a constant proper mass density of ρ per unit of unstretched length. We’ll use a parameter λ to describe the unstretched distance along the string, starting from the free end. where the first term comes from the total energy density of the string, and the second from the pressure. In order for this stress-energy tensor to satisfy the weak energy condition — the requirement that the energy density measured by any observer is non-negative — the tension in the string can not be greater than the energy density. where K2=k/(2ρ), and p(s1) = 0 as required by our boundary conditions. Because √(k/ρ) is the speed of sound in the string (in the small-amplitude limit, for the relaxed material), we should impose the restriction K2 < 1/2, in order that the speed of sound does not exceed 1, the speed of light. Here are some plots of –p(s)/k versus s/s1 for K ranging from 0.1 to 0.7. In other words, the string can not be stretched by a factor greater than Q/K. For K=1/√2, Q/K=√3; however, for smaller K this limit grows larger, so there is no universal bound that must apply to all strings. N.B. We have already restricted the value of K so that the speed of sound in the relaxed material does not exceed the speed of light. However, as shown on this page, the speed of sound will vary with the tension, and for a string under uniform tension, the speed of sound will reach the speed of light when it is stretched by a factor of Q/(√3 K), or just 57% of the stretching that would violate the weak energy condition. We can’t expect the same result to hold exactly for our suspended string (which will have a complicated dispersion relation, with different frequencies of sound travelling at different speeds), but it’s highly likely that the hyperelastic model will become physically impossible at some point significantly below the stretch factor of Q/K. Computing that point exactly is beyond the scope of this analysis, so we will present solutions that obey the hyperelastic model all the way up to Q/K, but these results need to be viewed with the caveat that even idealised materials will necessarily depart from them at sufficiently high tension. Below are some plots of the solution, for K ranging from 0.1 to 0.7. Note that as s/s1 → ∞, λ(s) is asymptotic to (K/Q) s, in the sense that the ratio of the two expressions tends to 1 (the difference between them does not tend to zero, but grows smaller as a proportion of the expressions themselves). Each curve starts at s2/L = Q/K, then descends to a minimum value for s2, below which there can be no equilibrium. Depending on how easily stretched the string is, this can occur when the top of the string is much further from the horizon than the unstretched length L, and even for the maximum value of K the minimum for s2/L is approximately 1.72. For values of s2 greater than this minimum but less than Q/K, there are two equilibrium positions for s1: a higher one, which will be stable, and a lower one, which will not. It follows that, for a given value of K (which sets the stiffness of the string) and a given value of s2 (the height of the top of the string), there is a maximum unstretched length L for a string suspended in stable equilibrium. For strings with the maximum possible stiffness (i.e. with a speed of sound equal to the speed of light), this is approximately 0.58 s2. The picture on the left shows strings of the maximum possible stiffness of various unstretched lengths L, all suspended from the same height above the Rindler horizon, in stable equilibrium. Segments of equal unstretched length are marked in bands of alternating colour. if you anchor the string from a safe point but with s2/L < Q/K, and then apply an extra force to drag the bottom end down past the point of unstable equilibrium, the string will be unable to snap back up, and will suffer the same unbounded stretching. If these results seem hard to believe, don’t forget that we’re talking about extremely powerful accelerations. The acceleration associated with s2 = 10 metres is 9.18 × 1014g, and although it’s obvious that you can’t trail anything longer than 10 metres behind you at that acceleration, we’ve found that even a string just 6 metres long would be doomed. Suppose a passenger named Adam on our flotilla of spaceships, travelling at an s coordinate of s0, steps off the ship. Without loss of generality we can choose coordinates so that he does this at (t, x) = (0, s0). His free-falling world line is then just x=s0, and his proper time will correspond to the t coordinate of our global inertial frame. At t=s0, he will pass behind the Rindler horizon, after which no signal from him can ever catch up with any part of the flotilla. Now suppose that Adam’s friend Eve was travelling with him at s=s0, and remains on the same ship. There is no finite q coordinate for any point on the Rindler horizon, which means there is no time for Eve when, in her co-moving inertial reference frame, Adam passes through the horizon. In that sense, Eve could claim that Adam never reaches the horizon as far as she’s concerned. However, not only is it clear that Adam really does cross the horizon, there is a time τcrit for Eve after which any signal she sends to Adam will reach him only after he’s on the other side. After a time of τcrit has passed for Eve, she must concede that it’s too late for her to send Adam a message asking him to hitch a ride and catch up with the ship, since every signal she now sends will be received by him on the other side of the horizon. Suppose Adam decides to tie a rope around his waist when he steps off the ship, but Eve agrees to feed out the rope in such a way that Adam remains in free fall. Is this possible? Clearly it is, because we can imagine a rope of arbitrary length sitting motionless in our (t, x) coordinates, and all Eve has to do to keep her and Adam’s rope slack is to feed it out in such a way that it matches that reference rope. This will require Eve to give the section of rope she is dispensing a velocity equal and opposite to her own ordinary velocity in the (t, x) frame, which is tanh(τ/s0). If Eve sticks to her notion of simultaneity then she’ll never admit that Adam has passed through the horizon, so her task is endless (and the velocity she needs to give the rope will asymptotically approach the speed of light), but if she takes a more sensible approach and concedes that after a time of τcrit has elapsed there’s no hope of hauling him back on to the ship, she will have fed out a length of just s0 [cosh(τcrit/s0) – 1] = s0/4 before reaching that point. The velocity at which she will be dispensing the rope at τcrit will be tanh(τcrit/s0) = 3/5. We should note that the velocity Eve must give the rope at the point where she is unreeling it does not equal the rate at which the total proper length of rope she has dispensed is increasing. The latter is equal to v/√(1–v2), or in this case, sinh(τ/s0). At τcrit, this rate is sinh(τcrit/s0) = 3/4. If Eve clamps down on the rope after τcrit (or in fact somewhat earlier, depending on the speed of sound in the rope), then the wave of tension passing down the rope will not reach Adam until he is behind the horizon, and however powerful an acceleration this gives him, he will not be able to pass back through the horizon, because that would mean travelling faster than light. When will the rope break? There is no particular time when this must happen; it will depend on the rope’s actual properties (though as we’ve noted earlier, the weak energy condition does put an upper limit on the amount by which any given rope can be stretched). The tension in the rope does not become infinite just because it crosses the horizon. What a clamped rope spanning the horizon does imply, though, is that it must eventually break, because the portion of it in the neighbourhood of the horizon will always be moving backwards relative to the ship. Suppose that Eve opens a box of dust and lets it waft freely out of the ship at a constant rate; in other words, by her clock the time between one particle and the next leaving the ship is constant. The world lines of these dust particles will be tangents to the ship’s world line. They are the straight grey lines, labelled by values of d, in the spacetime diagram below. The curves on the diagram that cross between the dust’s world lines, labelled by values of w, have been chosen to be orthogonal everywhere to those world lines. Someone like Adam, who jumped ship, would consider these curves (locally) to be surfaces of simultaneity. It’s interesting to ask what he would consider the density of the dust trail to be. To do this, we need to describe these tangent lines and the curves orthogonal to them in more detail. We’ve chosen to label the world lines of the dust particles by the ship time at which they were emitted, so where these lines commence at the ship’s world line, d=τ. We have also labelled the curves of constant w by the ship time when they meet the ship’s world line. Define k(x) to be the proper time that has elapsed for the dust since it left the ship, i.e. then it’s not hard to show that p = s0(sinh(d(x)/s0), cosh(d(x)/s0)) satisfies p · x = s02. then on the ship’s world line we will have w(x) = d(x) = τ. For generic events x, since k(x) is the proper time for the dust particle since it left the ship, and d(x) specifies the value of τ when it left, w(x) is the total proper time for the dust since it passed through the event (t, x) = (0, s0), including both its shipboard time and its time in free fall. It’s easy to see that the gradients of these functions are orthogonal. The magnitude of the gradient of d(x) turns out to be s0/k(x). Since k(x) is the proper time that has elapsed since the dust left the ship this is singular at the instant the dust leaves the ship, which makes sense because we’re modelling the source of the dust trail as a single point. Since the magnitude of the gradient corresponds to the particle density of the dust trail, our result shows that the spacing between the particles grows linearly with time. We’ve already seen that the proper time for any free-falling object to reach the Rindler horizon is s0, so as the dust trail crosses the horizon, k(x) = s0 and the local particle density becomes equal to 1. In other words, if particles were leaving the ship at a rate of 1 every second, they would now be spaced at one every light-second! If we imagine that this is some kind of smart dust made of particles that can signal to each other, then if a particle reaches the horizon and sends a light signal back to the one coming after it, the receiving particle will get the message at precisely the moment when it, too, arrives at the horizon. The dust-trail scenario can easily be generalised to the case where the dust is thrown out backwards with a speed of –v, by replacing s0 in the preceding analysis with s0 / √(1 – v2). Then by the time the dust has reached s=s0, it will have a velocity relative to the flotilla of –v. We’ve seen that it requires an acceleration of 1/s to maintain a fixed distance of s from the horizon, an acceleration that obviously grows without bounds as you approach the horizon itself. We’ve also seen that there is no problem with free-falling right through the horizon (apart from the fact that you can’t cross back). This leads to the question of exactly what kinds of motion, apart from free fall, can take you through the horizon. To what degree can you control your fall, without requiring infinite acceleration? Suppose Adam decides that, rather than free-falling through the horizon, he wants to use a rocket backpack to control his descent. His goal is to maintain a constant ordinary velocity of –v relative to each ship in the flotilla that he passes, all the way down to the horizon itself. Of course any real flotilla must end at some finite distance above the horizon, but Adam plans to follow the same criterion whether there’s an actual ship beside him or not. This verifies our claim that the ordinary velocity Adam and the flotilla ship will measure for each other has a magnitude of v.
In other words, his acceleration is just as singular in s as that required to remain stationary with respect to the horizon. In fact the acceleration for any given value of s is actually greater when v is non-zero! So Adam’s goal of passing right through the horizon in this manner is physically impossible; even though he’s not trying to remain stationary, his rocket would still have to provide an infinite acceleration as he crossed the horizon. What does this tell us about lowering an object on a string? We can’t say that we’ve ruled out the possibility of feeding out string from a reel at a constant rate, because the unavoidable elasticity of the string means the object being lowered need not end up moving at a constant velocity relative to the flotilla. There is also the further complication of the difference between clocks at the top and bottom of the string. So we can only say that any scheme that aims to adjust the rate at which the string is fed out in such a way as to cause the object itself to be lowered at a constant rate compared to the flotilla (according to its own clock) will necessarily fail as the object approaches the horizon. Now that we can see that Adam must accelerate with respect to the flotilla as he passes through the horizon, let’s try to estimate the kind of acceleration that’s necessary. The sign inside the square root here reminds us that we’ll have to consider everything for small negative values of τ, not positive ones, because the s coordinate is not defined on the far side of the horizon. So in order to achieve a finite proper acceleration at the horizon, Adam must accept that he will see the s coordinate of the flotilla changing with respect to his proper time in this fashion. Note the inverse square relationship: the lower Adam’s proper acceleration, a, the greater the coefficient in the leading term for the second derivative of s.
for some constants A and B. Of course, if the event (A, B) lies above (or to the right of, in a conventional spacetime diagram) the Rindler horizon of the reference flotilla, the entire primed flotilla will also remain above the horizon, so those values of A and B will be of no use to us. no influence from Eve can reach the bottom of the string before it goes behind her Rindler horizon. At τ = τcrit (as at all finite values for τ) everything Eve measures about the string — the tension, the rate at which she is feeding it out, and the total length she has unreeled — will all be finite. However, if Eve tries reeling the string back up after this time, the bottom will remain on the far side of the horizon, and the string will eventually break. The function v(τ) which describes the velocity at which Eve must unreel the string is plotted below for the case s'1 = s2 = 1, for various values of v0. Also plotted is τcrit as a function of v0 (the red curve). Naturally the slower the string is being unwound, the longer it is until the bottom of the string has effectively been lost behind the horizon. The velocity at which the string is being unwound by Eve when this happens, v(τcrit), is shown on the graph for a few different values of v0. For s'1 = s2, in the limit of v0 → 0, v(τcrit) → –1/3. In other words, for a string that starts out being unreeled slowly, there is a ceiling of roughly one third lightspeed on the speed at the point of unreeling at τcrit. Although the descending string described in the previous section has the advantage of an exact, analytical solution, it’s a rather artificial set-up. What we’d really like to understand is what happens when a string is unreeled at a constant rate. which is just the x coordinate of the constantly accelerating observer who is unreeling the string. It might seem odd to think of the string’s velocity relative to the person unwinding it not being constant, despite the fact that a constant amount of unstretched length is being unreeled. However, unless some mechanism completely isolated the portion of the string wrapped around the reel from the tension in the rest of the string, the string on the reel would be stretched to some degree, so the reel would be rotating ever faster to dispense unstretched length at a constant rate. If a tension-isolating mechanism was used, the string would be accelerated within that mechanism, as it underwent the transition from zero tension to full tension. Our “unreeling observer” with acceleration a will overtake the frame with the static string and acceleration a', but if they start out with the bottoms of their strings coinciding — and with the “unreeling observer” already moving with speed R relative to the static string — then the tension and velocity of the two strings will match all along their length. The plot below shows the trajectories of elements of the string separated by equal increments of unstretched length λ, along with the trajectory of the unreeling point. Here we’ve made use of the expression for dλ/ds' derived in our treatment of a static string suspended above a horizon, and ds'/dτ comes from the change of coordinates between different flotillas discussed in the previous section. We’ve given the second-order Taylor series, to make it clear that the first-order term is zero, but taking account of higher order terms doesn’t help; the exact expression is unbounded as τ increases. In fact, it’s asymptotically proportional to exp(τ/(2 s2)). This is slower than, but not all that different from, the free fall rate of dispensing string, sinh(τ/s2). So, when viewed from a flotilla whose horizon the static string eventually crosses, the “rate of unreeling” of the string will be unbounded. This in turn suggests that a string being unreeled at a constant rate will experience greater tension than the static string, because unreeling the string more slowly will generally increase the tension. But the tension in a static string is already asymptotic to the limit set by the weak energy condition, so it seems likely that a string being unreeled at a constant rate will eventually exceed that limit and break. The graph below shows the tension as a function of λ along a succession of spacelike slices. The results are quite close to the Newtonian values, for which the tension would simply be directly proportional to λ everywhere. For comparison, the tension in a static string (which matches the rate of unreeling to first order) is shown; this does not increase as rapidly with λ. Note that the limit on the tension set by the weak energy condition, (Q/K – 1), is 9.05. Where the results depart most clearly from both the Newtonian case and the relativistic static string is in the acceleration of elements of the string. This is plotted below, for the same spacelike slices as the tension. Whereas the acceleration in the Newtonian case is both constant in time and identical for all elements of the string, and for a static string each element has a constant acceleration which is smaller for higher values of λ, in the case of constant unreeling, the acceleration of each element increases over time as well as decreasing along each spacelike slice. Although a string lowered in this fashion appears doomed to break eventually, this example shows that there’s no reason it can’t survive intact not only after τcrit, but also after the bottom of the string has passed through the horizon according to the string’s own definition of simultaneity. In other words, a spacelike slice orthogonal to the world lines of the string’s elements can run all the way from the bottom of the string, on the far side of the Rindler horizon, to the point of unreeling, with the tension everywhere remaining well below the limit set by the weak energy condition. The animation on the left shows a string being unreeled at a constant rate, with R=0.2 and K=0.1. The distance shown vertically here is measured along the spacelike slices, so it is “proper distance” in the sense that these slices are everywhere orthogonal to the world lines of the elements of the string. The bands along the string are segments of 0.02 unstretched length; the animation shows the unreeling of a total unstretched length of 0.36. The red line that appears during the descent marks the Rindler horizon; the distance from the point of unreeling to the horizon, measured along these spacelike slices, is not fixed. Given some function of proper time which expresses the rate at which the string is being unreeled, there will be a time τcrit after which no signal from the point of unreeling can reach the object at the end of the string before it passes through the horizon. After τcrit, the only way to keep the string from eventually breaking (assuming it hasn’t broken already) will be to continue to feed it out at an increasing rate. Clamping the string, attempting to pull the object back up, or even just feeding out the string at a constant rate, will all ultimately cause the string to break, though the exact time when that happens will depend on the physical properties of the string. The Rindler metric for flat spacetime and its similarity to the Schwarzschild metric for black holes is discussed in Section 6.4 of General Relativity by Robert M. Wald. The coefficients of the polynomial P were then found by requiring that all derivatives of the PDE up to order 32 were zero (at the point λ=0, τ=0), and that the tension at the bottom of the string was zero to the same order in τ. The solution was validated by comparing the purely geometrical proper acceleration of each world line with the acceleration required by the PDE; for the data displayed, these two values differ by less than 1%. More details on the derivation of the PDE can be found in this supplementary page on relativistic elasticity. Copyright © Greg Egan, 2006-2007. All rights reserved.